On April 24, Vice-President Jejomar Binay, Sen. Miriam Defensor Santiago, Davao City Mayor Rodrigo Duterte, Sen. Grace Poe, and former Department of Interior and Local Government Secretary Mar Roxas will respond to questions about their platforms and stand on the most urgent issues facing the nation, during the Presidential Town Hall Debate organized by the COMELEC, KBP, ABS-CBN, and Manila Bulletin. Happening two weeks before the national elections on May 9, ABS-CBN Integrated News and Current Affairs head Ging Reyes said the Filipino people can expect all five candidates to give their best and go all-out as they try to pull away from what is shaping up to be the tightest race to the presidency in recent years. “We encourage voters to watch the debate. Wherever they are, ABS-CBN, with the COMELEC, KBP and Manila Bulletin – through all its platforms – will deliver this very important event to the Filipino people. Voters still have time to make up their minds about the candidates. Listen to their proposed policies, analyze their plans, look beyond motherhood statements and empty promises. This final debate is the last opportunity for voters to see where candidates stand on issues and how they differ,” she said. The nation will be watching as five candidates for the highest post of the land share one stage for the last time in the final leg of the Commission on Elections' PiliPinas 2016 presidential debate series. The third PiliPinas Debate is the last big opportunity for the candidates to prove they are ready, capable, and worthy to lead the country before millions of Filipinos here and abroad, as the debate will be aired live from the Phinma University of Pangasinan over multiple media platforms – ABS-CBN on free TV, ANC, the ABS-CBN News Channel ch. 27 on cable TV, DZMM TeleRadyo on digital television (ABS-CBN TVplus) and SKYcable ch. 26, DZMM 630 on AM radio, and online via livestreaming at news.abs-cbn.com, iwantv.com.ph, and mb.com.ph. ABS-CBNmobile MHP users can also watch it on their mobile phones by downloading the new iWant TV app and then choosing livestream via ABS-CBN HD or regular ABS-CBN stream, while ABS-CBNmobile prepaid users can view it by texting <IWANTV10> to 2135 for 1-day full access and then choosing livestream via ABS-CBN HD or regular ABS-CBN stream. Overseas Filipinos, on the other hand, can watch it via TFC, the Filipino Channel and it will also be streamed live on IPTV and TFC.tv. The town hall debate, which will be moderated by ABS-CBN’s top broadcast journalists Karen Davila and Tony Velasquez, can also be viewed in high-definition on ABS-CBN HD Ch.167 and ANC HD (SKYcable Ch. 182 for Metro Manila; Ch.706 for SKYcable regional subscribers). With a town hall format, ordinary Filipinos - representing different sectors in society - will be asking the questions to the aspiring presidents of the Philippines. 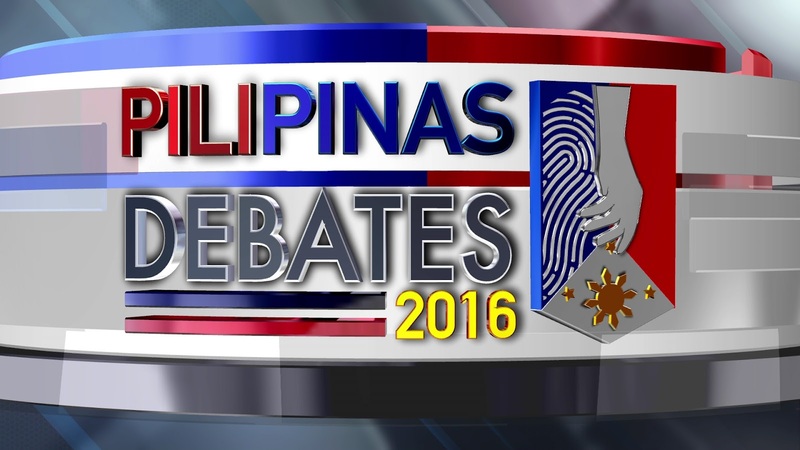 This format was assigned to ABS-CBN after a “drawing of lots” facilitated by the Comelec involving all lead networks for the debate series. The sectoral representatives were chosen among thousands of Filipinos all over the nation and the world who sent in their queries for the presidential candidates via ABS-CBN’s “Halalan Hugot” campaign. Their questions will touch on very relevant and pressing issues such as metro traffic and public transport, job security, health, foreign policy, basic public education, OFW concerns, and peace for Mindanaoans in conflict areas. Each presidential candidate will get to answer all questions, which will allow the public to compare and decide which candidate is truly prepared and committed to address the issues raised. The town hall debate will be held at the student plaza of the Phinma University of Pangasinan. The candidates will also have an opportunity to challenge each other during the Face-Off segment. One candidate may grill a fellow candidate on his ability to govern and lead. Watch the Comelec, KBP, ABS-CBN and Manila Bulletin’s PiliPinas 2016 Presidential Town Hall Debate LIVE on April 24, 6pm on ABS-CBN, ANC, DZMM TeleRadyo, DZMM 630, and online via livestreaming at news.abs-cbn.com, iwantv.com.ph, mb.com.ph, and through ABS-CBNmobile. Overseas Filipinos, meanwhile, can watch it via TFC, the Filipino Channel and it will also be streamed live on IPTV and TFC.tv. Also catch the “Halalan 2016 Debate Special” starting 3pm on DZMM TeleRadyo with Julius Babao and Jing Castaneda, at 5pm on ANC with Alvin Elchico and Lynda Jumilla, and 5:45pm on ABS-CBN also with Elchico and Jumilla. Viewers of the livestreaming at news.abs-cbn.com can also catch a digital special hosted by TJ Manotoc, who will discuss the social media buzz on the on-going debate.